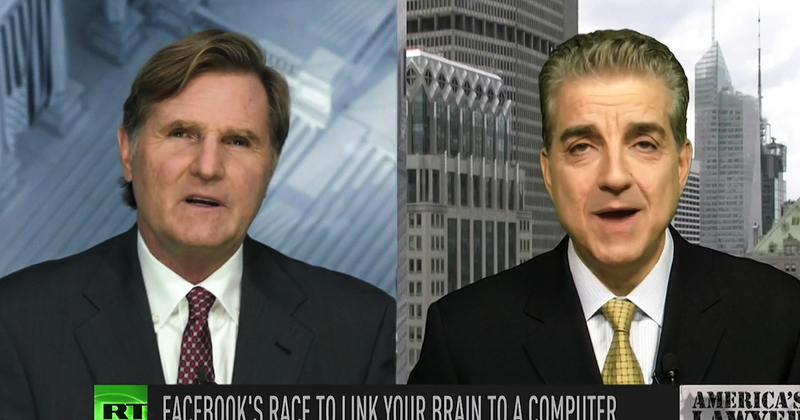 Via America’s Lawyer: Political Commentator Steve Malzberg joins Mike Papantonio to talk about the controversial decision by Facebook to link your brain to a computer. Mike Papantonio: Facebook CEO, Mark Zuckerberg is researching a new mind reading technology, which is going to allow users to use their thoughts to navigate intuitively throughout the augmented reality. Steve Malzberg joins us for this story and no this is not an Onion story, it’s really happening. Steve, how this technology works, I, I had to do a triple read of the story. I know, there, the technology certainly is there. We, we’re finding that we’re able to do a lot of biometric kind of things. But as, as this is, as this is developing, you listen to, to, to mark Zuckerberg and it sounds like it’s way down the road. What’s your take? Steve Malzberg: Well, you know, it’s being used for people with ALS. They’re able to, some of them are able to type just by thinking and that’s, that’s what he envisions here. But I think he has more nefarious, uh, plans. It’s not an implant. They don’t put anything in your, into your head. This is interface that it reads your brain activity you put on, it looks like a shower cap. Okay. And it’s surrounds the brain and it discovers connections between your thoughts and brain activity. And it also makes use of optical imaging technology. And presumably by the way, coincidentally using glasses manufactured by Oculus Vr, which is owned by Facebook. So, you know, it’s all kind of incestuous there. Yeah. Mike Papantonio: As I saw this story developed where Zuckerberg shows up at Harvard and he’s giving a speech on the, the reality of, of technology. Where are, where are we, where’s it going, how’s it going to get better? And this is where he, he, he reveals this, that he’s been working on. And with so many Facebook innovations, Zuckerberg doesn’t seem to see how brain computer interface breaches individual integrity and that, that came up in the, in the, where he gave the speech. A law professor said, you know, we still have a fifth amendment. Mike Papantonio: We don’t want you in our heads. You’re already, you’re already following us around by phone, by, by IPAD. My God, we can’t get away from technology and now you want it to get right up in our head. What’s your thoughts? Steve Malzberg: Oh, absolutely. I mean the red flags are just popping up all over the screen. They should be popping up in our heads as well. I mean, do you trust Mark Zuckerberg and Facebook when we know how our information has been shared and, and abused and, and they’re spying on us and all that kind of stuff. Do you want them to know your thoughts? What’s inside your head the way, as you said they do with smart phones and our computers. And then what happens if, if your thoughts get out, we know that we risk our medical information getting out and all kinds of different things. But if they knew what you were thinking, would you be prosecuted? Which you’ll be blacklisted? Would you lose your job? I mean the, the, the possibilities are limitless and they’re all frightening. Mike Papantonio: Well, look, Facebook, you know, they want to establish their own what Zuckerberg calls his own supreme court. And let me tie this up a little bit. We all know that as you point out, they’re spying on us. They’re following us. They’re, you know, now they’re making decisions about what’s, what, what we can say. And what we can’t say. If they’re offended by what we say, they take it off the air. If they’re, if they like what we say, then they promote it. So what we have is this, all of this type of censorship taking place. And so he was really assaulted with those talking points when he gave this speech at Harvard. And so his response was, well, I haven’t been talking about this folks, but I want to tell you something. He made this announcement. Facebook is going to have a supreme court and the supreme court that I suppose he’s going to a, is going to appoint is, is going to deal with these thorny questions about what appears on the Facebook platform. Did you follow this? Did you follow this part of the story? Steve Malzberg: Oh yeah, absolutely. I mean, he says, I don’t want to make these decisions of censorship or he didn’t say censorship, what goes, but it doesn’t go. So he’s appointing or they’re appointing a 40 people, independent experts that will decide if a given comment should stay or go, what’s hate speech? What’s hate, what’s appropriate? What, I mean, every, every possible piece of censorship these 40 people will have. Now, are they going to go against what Zuckerberg thinks and Zuckerberg is not going to play any role. He’s not going to be the chief justice in this Supreme Court. He Says No. So you’re shifting power to a group put together by Facebook and Zuckerberg. I mean, there are 2.3 billion users. There are mil, millions of cases every day. How could they even monitor this with 40 people? That, none of it makes sense. Mike Papantonio: Steve, I want to have you back on and I want to analyze how the numbers are showing that millennials are just fine with this level of censorship, that in their mind, somebody should be making a decision about the things we think about. Thank you for joining me, Steve. We’ll pick up this conversation again.